CD71 antibody recognizes transferrin receptor protein 1, also known as TR, TfR, TfR1, Trfr, T9 p90 or CD71. The antibody has been extensively validated for western blotting using whole cell lysates. Mouse anti Human CD71 (soluble) antibody recognizes the human soluble transferrin receptor (sTfR) also known as sCD71 or p90. CD71 is a single pass type II membrane glycoprotein of ~90 kDa containing a single protease associated domain. sCD71 forms a homodimeric complex, a truncated form of the membrane bound transferrin receptor lacking the cytoplasmic and transmembrane regions of the molecule (Shih et al. 1990). It is responsible for the uptake of iron into the cell by binding to and internalizing iron-bound transferrin (Kogan et al. 2005). After the iron is released into the cell the apotransferrin is relocated to the cell surface, cleaved at Arg-100 and released into the circulation. In healthy adults almost all transferrin receptors exist in the soluble form (Shih et al. 1993). The level of soluble CD71 is used to detect erythropoietin misuse by athletes (Borrione et al. 2007). It is also used to diagnose iron deficiency anemia (Kamer et al. 2012). Mouse anti Human soluble CD71 recognizes human both the soluble transferrin receptor and the complex between soluble transferrin receptor and transferrin. The antibody recognizes CD71 as a single band of ~90 kDa in multiple human cell line lysates by western blotting under reducing conditions. 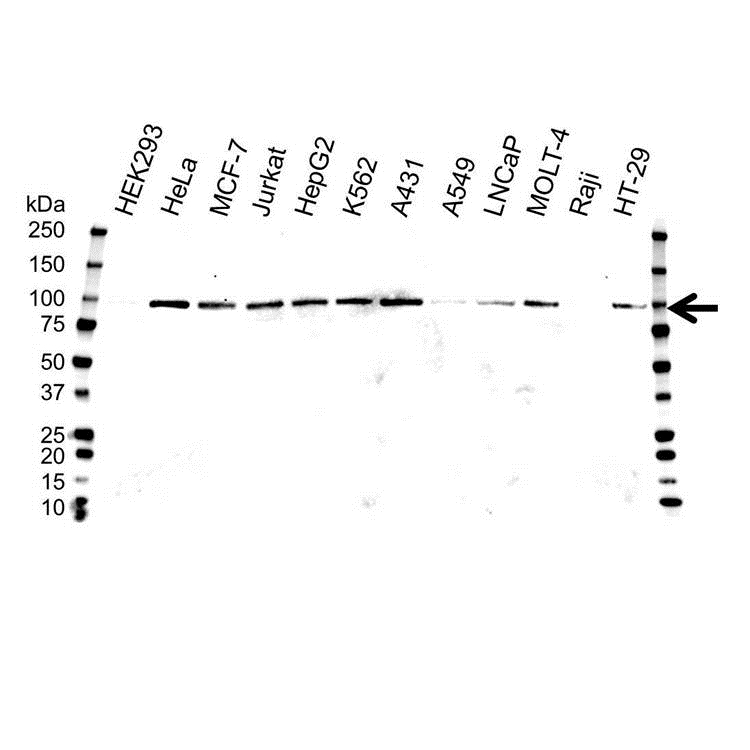 Anti CD71 (soluble) antibody detects a band of approximately 90 kDa in K562 cell lysates.